If spidey ever intended to have an aide this would be it. 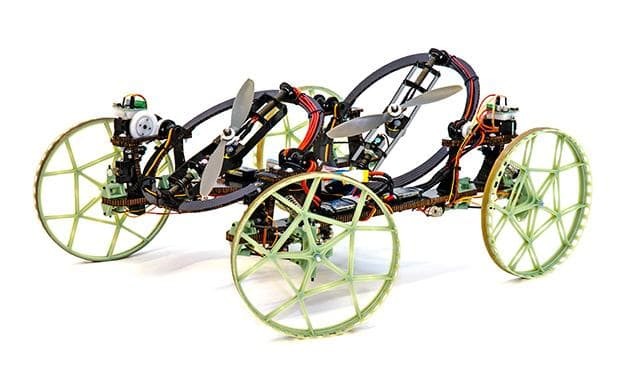 Not even walls can stop Disney’s and ETH Zurich’s new four-wheeled robot called VertiGo that can quickly transition from rolling on the ground to climbing obstacles, just like a gecko though without those sticky feet. The wall-climbing bot created in collaboration between Disney Research Zurich and ETH runs on four wheels, with two tiltable propellers that provide the thrust and hence the robot is able to traverse over indentations such as masonry. One pair of wheels is steerable, and each propeller has two degrees of freedom for adjusting the direction of thrust. By transitioning from the ground to a wall and back again, VertiGo extends the ability of robots to travel through urban and indoor environments, this is also how the robot is able to move on a wall quickly and with agility, the researchers were quoted as saying. The key problem to be overcome in the research was to maximize the ratio between thrust output and vehicle weight. Researchers minimized the weight by using a central carbon fibre baseplate, while 3D-printed parts in conjunction with carbon-rods were used for more complex three dimensional structures such as wheels and wheel suspensions.The thrusters were mounted using a two-ringed Cardan Suspension, which supported the generation of all the forces required to drive on the floor, on walls and theoretically even on the ceiling. The propellers being adjustable allow the driver to have more control over the direction of thrust. The bot zips along on the grass and nobby rough surfaces without slowing down while its body houses electronic components, including a computer that allows the person operating VertiGo to control the bot in the same way as a remote-controlled car. It uses data from a 6-axis IMU in the centre of the robot as well as from two infra red distance sensors mounted in front to estimate its orientation in space. However no details have been shared about the bot's battery life in the research paper. VertiGo is just a prototype at the moment. Dr Paul Beardsley, principal research scientist at Disney Research Zurich, clarified that there was no plan for a production version for the public at the moment. He also remarked that the wall-climbing robot may be used in the entertainment industry for visual effects with possible other uses such as industrial inspection. The other applications might also include military and emergency use, or for scouting out areas too dangerous for people to climb.